UK inflation came in below expectations in May, staying flat at 0.3%, according to official figures released on Tuesday. The Office for National Statistics says the consumer price index — the key measure of inflation in Britain — was up 0.3% on a year-on-year basis in May, below the consensus forecast of economists of 0.4% growth and flat from April’s reading. The month-on-month figure came in at 0.2%, a miss on the expected 0.3% rise. Core inflation figures, which strip out volatile goods like oil and food, came in at 1.2%, again below expectations, and flat from the previous months. Prior to the last few months, inflation had stayed between -0.1% and 0.1% for 10 months due to a collapse in oil prices and a supermarket price war that led to slashed prices, but prices had started to pick up, however with the UK’s EU referendum looming, prices have once again stopped growing as quickly. 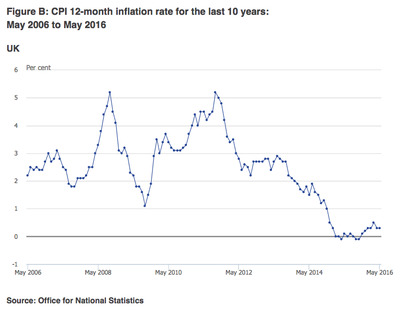 Here’s the inflation picture for the UK since 2006. 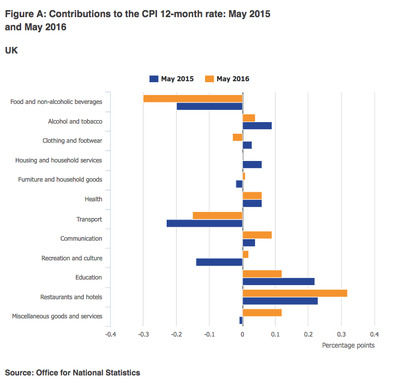 While inflation has broadly improved in recent months, April’s reading was a first fall in eight months, and May’s reading is no better. 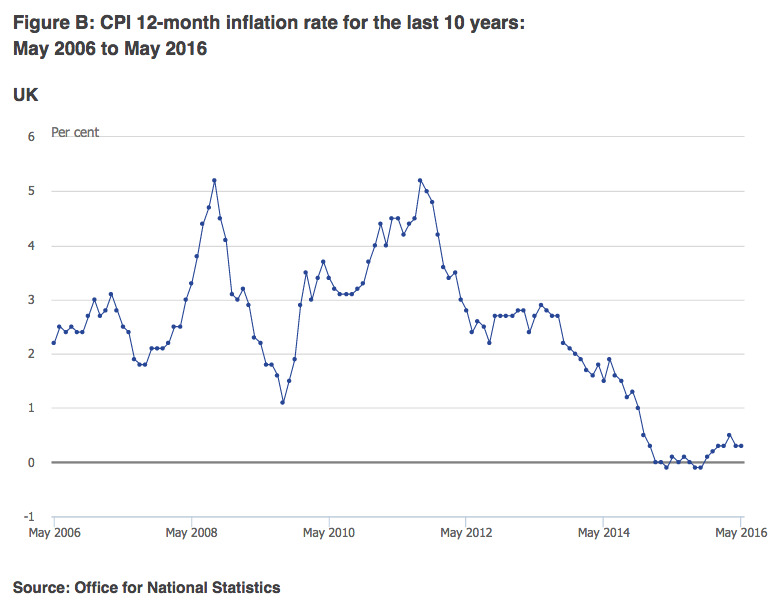 Inflation remains well below the 2% wanted by Britain’s policymakers, a figure it hasn’t hit since late 2013. Alongside the core figures, the ONS releases a breakdown of inflation by sector. In May, the biggest increases in prices were in the restaurant and hotel trade, but inflation was dragged by fall food and drink prices, as well as a decrease in the price of transport.